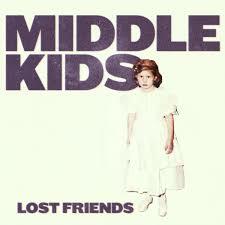 Middle Kids is a trio from Sydney in Australia. It has released a self-titled EP in 2017. It's spring 2018 and here's the debut album by Hannah Joy (voice/guitar), Tim Fitz (bass) and Harry Day (drums). Let me fall in through the door so we have that behind us right away. Should you expect or want to hear something new, a novel style or original interpretation of a familiar style, in that case you might be disappointment. However, if you like alternative rock with alternating energetic and a more melancholy moods, including a firm singing female lead vocal, you better stick around as Middle Kids presents several songs on Lost Friends fitting these descriptions perfectly. On the cover we are taken back quite some years with a girl dressed up for something like a first holy communion, as a little bride. In 2018 perhaps girls still go to their first communion like this. I can't tell, I just do not know anyone any more who have their children do this. Hence I associate the cover with something from the past. With (long) lost friends indeed. Does the music associate me with the past? Much less. The name coming up first is Florence Welch. A huge sound around a solid voice. Hannah Joy is graced with a loud sounding voice. The music can be just as dynamic. At times a bit overwhelming. I find I have to be in the mood for the album as a whole. Most individual songs are quite fine. The whole is at time too much of a good thing. It is here that the intro of the title song comes as a welcome island of rest on the album. The same feeling I have with the albums of the lady singer who I compare Middle Kids most with. Taking in the album as a whole I find that I like the songs where Middle Kids dares to hold back a little, where it sounds like it does not need to conquer a whole stadium with its songs, the best. Where inner dynamics are applied, like in a song called 'Never Start', where the drums take on a nice rolling rhythm, taking the song into a totally different direction and back. The album starts much more alternative than it ends. 'Bought It' is a layered song, but also a song that hides a part of its intentions better. The guitar rhythm and sound can be associated with early 80s songs by e.g. The Cure or New Order. The eruption is totally punk. 'Mistake' is a tight alternative rock song. All this raises expectations that are not met from the middle section of the album onwards, where Ms. Welch wins out. This leaves me behind with mixed emotions on how to really appreciate Lost Friends. Perhaps just like with lost friends. At times wondering how they are and what they might have become, a latent feeling of missing something, while fully realising that things are truly over and never will be the same again. So I decided to enjoy what I have playing here and now and not mesmerise over things that might have been. For the other songs on Lost Friends there is that brilliant invention called a skip button.